In 1930, Delray had approximately 23,000 residents. As of the 2010 Census, the two tracts that cover the area had a population of 2,783, a 33% decrease in population from the 2000 Census. Residents have left over the years due to the increased industrialization and decay of the neighborhood. Much of Delray consists of riverfront industries, interspersed with residential properties, mostly single-family and duplex houses. Due to this high level of disrepair, in 2007, the Detroit Metro Times described Delray as "the closest thing to a ghost town within a city." Delray was selected for the location of the upcoming Gordie Howe International Bridge. The enormous project will radically alter the neighborhood and result in the destruction of numerous structures and roadways, as well as the relocation of some residents. Delray is located at the southern edge of the city limit of Detroit, although it is not the city's southernmost territory. The neighborhoods of Boynton and Oakwood Heights occupy the southernmost strip of Detroit along Outer Drive and Fort Street extending down to the city of Lincoln Park. With no official boundaries, Delray is considered mostly conterminous with two Census Bureau tracts that cover 2.938 square miles (7.61 km2). Major thoroughfares through Delray, which typically represent the neighborhood's boundaries, include Fort Street, I-75 (Fisher Freeway), and West Jefferson Avenue. Delray is relatively isolated from the rest of the city. 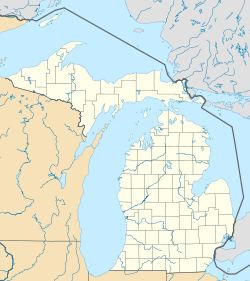 The southern border of Delray is the River Rouge, with the city of River Rouge on the southern side of the river. The two are connected by the West Jefferson Avenue-Rouge River Bridge. Due to a bend at the mouth of the River Rouge, Delray is also bordered on the southeast by the river as well. Across the river at that point lies Zug Island, part of the city of River Rouge. North of Zug Island, Delray borders the Detroit River on the east. No residents of Delray live along either body of water as the land is devoted to riverfront industries and the historic Fort Wayne. Delray is about five miles (8.0 km) west of Downtown Detroit. In 1935 Delray formed the southern portion of Wards 14, 16, 18, and 20. Since 2013 the neighborhood lies within District 6. Historic Fort Wayne, built 1843 to guard Detroit from British attack from Amherstburg's Fort Malden, is located at the northeastern end of the neighborhood. The area known as Delray was first platted as "Belgrade" in 1836. It was renamed as "Del Rey" on October 14, 1851. Augustus D. Burdeno, after returning from the Mexican–American War, convinced other residents to rename the town. He had encountered a Mexican village named "Del Rey" ("of the kings") during the Mexican-American War. This was associated with the Battle of Molino del Rey. At a later point the name was anglicized to "Delray". Most of the village sat in what was Springwells Township, with the rest sitting across the River Rouge in Ecorse Township. In 1870 it received a post office. It incorporated as a village in 1897. By 1870, salt was mined there and, shortly thereafter, industries located in Delray thanks to its favorable location along the Detroit River and near the several rail lines that linked Detroit to Toledo. These industries were established long before there was any concern with pollution or environmental degradation. Around 1889 many Slovaks, Hungarians, and Poles settled in Delray. Dense housing arrangements appeared to accommodate the immigrants going to Delray. In 1894 Solvay Process Company opened a chemical plant. The company provided a fire service and paved streets to Delray. In 1901 Detroit Iron Works built two iron-making blast furnaces on Zug Island, near Delray. The city of Delray Beach, Florida, in Greater Miami was named after Delray in 1901. In 1906 Detroit annexed Delray. Chemical plants and factories opened in Delray. As years passed, residents who were able moved to larger homes in less industrial neighborhoods. As the value of the housing stock declined, absentee owners did not spend on renovation and tenants did not repair their damage thus leading to continued falling values and a desire of tenants to rent rather than own. In 1929 the railroad built and owned the Detroit Union Terminal at the corner of Fort Street and Green Street, which later was renamed the Detroit Produce Terminal. It is an efficient location for wholesale distributors to receive semi-truck loads of produce from throughout the world, via east coast ports and the southwest border with Mexico. As crops are harvested across the US and Canada, they are delivered to the wholesalers who market to buyers who walk the corridors between various produce display rooms. Most restaurant patrons and grocery shoppers in Metro Detroit and other Michigan communities have competitively priced fresh food each day because of the direct and indirect impact of the market. Delray had around 23,000 residents in 1930 according to former residents, which is about the number in the two census divisions that encompassed the neighborhood that year. Delray reached its highest population density in that decade. A wastewater plant opened in the area in 1939, leading to demolition of houses in Delray causing the first major decrease in resident population. When I-75 was built in the 1950s and 1960s, many more houses in Delray were razed. The wastewater plant received an expansion in 1957, leading to more loss of houses. In the 1990s the neighborhood dealt with large gang membership. Numerous gangs were targeted in policing efforts to control crime and recruitment including the Cobras, Cash Flow Posse, 138, Gangster Disciples, Latin Counts, Latin Kings, and the Delray Mafia. Many businesses in Delray closed during the late 2000s economic recession. In addition, around that time U.S. Steel had taken over nearby Zug Island. Many workers had been laid off during the recession. According to the 2000 census, 3,100 lived in Delray. John Carlisle (DetroitBloggerJohn) said in a 2009 article in the Detroit Metro Times that "a foul stench" was present in Delray due to the wastewater plant and the factories still operating. Due to EPA air pollution regulations, a number of air quality improvements have been made, but much of that was due to closings of antiquated facilities. Even so the transhipment industry grew which has comparatively little[clarification needed] health impact, and a handful of warehouses near the Detroit Produce Terminal were converted into temperature-controlled storage facilities specifically for fruits such as bananas and pineapples. In the 2010s, Delray gained attention in the state as a result of the debate over the Detroit River International Crossing, the construction of which would lead to the demolition of much of, if not the vast majority of, the blighted neighborhood. In 2017, the city government offered to buy out houses in the bridge development zone, giving away empty houses outside of the bridge zone to people accepting the offer, plus paying up to $60,000 per household for renovation costs and foreclosing all taxes. Some families accepted the deal, and some refused. The Ambassador Bridge operators went to court to block evictions, but the court case was dismissed in May 2018. In July 2018, the builder of the bridge was selected, and clearance work in Delray will begin. There were about 2,100 people according to Census estimates in 2014. As of 2017[update] about 33% of the population was non-Hispanic white, 33% was Hispanic, and 33% was black. In 1897 Delray had about 5,000 people. In 1930 the population was about 24,000. This declined to 20,000 in 1940, over 17,000 in 1950, and under 13,000 in 1970. In the early 20th Century the Delray-Springwells area served as the "Little Hungary" of Detroit and Michigan's Hungarian culture was centered in that community. In 1898 the Michigan Malleable Iron Company began operations in Delray. Hungarian immigrants moved to Delray from cities including Cleveland, Ohio; South Bend, Indiana; and Toledo, Ohio, in order to get better working conditions and better wages. The first wave of Hungarian refugees came to the U.S. in order to escape the Austro-Hungarian Empire's political issues. In 1904 a society to establish a Hungarian Lutheran church had about 60 members, There were also plans to establish a Catholic church, but by 1905 the Hungarians had difficulty agreeing on a final site. Later that year the Holy Cross Hungarian Church, a Hungarian Catholic church, opened in Delray. By 1911 about 5,000 Hungarians lived in Delray. In 1906 the Hungarian population began resisting the actions of the town police. In 1907 some Hungarians in Delray and Wyandotte who feared a lack of work returned to Hungary. After World War I a second wave of Hungarian refugees arrived, who emigrated due to religious and political reasons. Hungary had been reduced in size so many Magyars were escaping discrimination, intimidation and deprivation in the conquered lands of the former enemies of Hungary, often because of the roles they had played in the war. They selected Detroit because the automobile plants paid high wages. As the number of Hungarians in Delray increased, a new church of the Holy Cross Hungarian Catholic Church opened in 1925. In 1935, Doanne Erdmann Beynon, author of "Crime and Custom of the Hungarians of Detroit," wrote that "it may be assumed" that the Hungarian colony is within an area that extends from Fort Street to the Detroit River and from Clark Street to the Rouge River. He stated that even though the former Delray municipality had "definite" boundaries the boundary of the "Hungarian colony of Delray" was "zonal" and that the lines "fade off indeterminately into areas that do not belong to the colony." He wrote that within this colony, immigrants from all parts of Hungary lived next to each other and did not settle in different areas according to their places of origin. The exception was an area on Barnes and Medina Streets called "Magyar Negyed" where the immigrants mainly originated from Sarud in Heves County. Beynon wrote that the residents preserved "the peculiar customs and, to some extent, the costumes of the home village." Beynon wrote that in Delray the individual village cultures in Hungary were mixed into a new pan-Hungarian way of life in Delray. During the time Hungarians inhabited Delray, a common phrase was "Within Delray the village life flows on" (Hungarian: Delray-ben foly a falusi élet). Various Hungarian social clubs including athletic, altar, dramatic, sick benefit and insurance, singing (Dalárdák), and social clubs were formed. Each club included a membership and a wider group of adherents or pártolók. Beynon wrote that "Practically every Hungarian of Detroit who has not broken away entirely from the people of his own nationality is connected in some way with one or more of these societies or clubs." As of 1935 many Hungarians in Delray had been socially isolated to the community and persons who had lived 15 to 20 years in Detroit had never visited the city center. Kossuth Day was celebrated in Delray. Beynon argued that due to Delray's fragmentation among many different wards it was "not possible to determine from the population statistics published by the Bureau of the Census either the number of Hungarians resident within the colony or the population which these form of the total Hungarian population of Detroit." Using the Detroit Board of Education's Detroit City Census, Beynon concluded that in 1925, 45.46% of Detroit's Hungarian population lived in Delray. Using a list of Hungarian surnames in the Detroit City Directory published by the company Polk, Beynon concluded that 44.27% of the Hungarians lived in the Delray colony and 55.72% lived outside of the Delray colony. During the Great Depression the Daughters of Divine Charity served in a Hungarian-operated orphanage on South Street. From January 1, 1927, to March 11, 1932, the Wayne County Juvenile Court received 462 complaints filed against Hungarian boys, with a total of 380 boys involved. Of those boys, 140 were from the Delray Hungarian colony. One wave of Hungarians arrived after the end of World War II. Another wave of Hungarians escaped the Hungarian Revolution of 1956, causing more to arrive in Delray. The construction of Interstate 75 in the mid-1960s destroyed large parts of Delray and divided the community into two pieces. Middle and working class Hungarians moved to Allen Park, Lincoln Park, Melvindale, and Riverview. The Holy Cross parish school closed. The Holy Cross Hungarian Church was scheduled to observe its 75th anniversary on September 17, 2000. By August of that year, renovations and polishing were underway. Residents of Delray are zoned to Detroit Public Schools (DPS). Clemente Elementary serves Delray for elementary school. All residents are zoned to Western International High School. From 1894–1999, James McMillan School was located on West End Street in central Delray. Originally opened as an elementary school, it was absorbed into DPS in 1907. It was converted into a high school but back into an elementary school for the district in 1916. McMillan Elementary School operated until the end of the 1999 school year, when DPS shut down the school. After it was closed, it remained unused with no intentions of being reopened. It subsequently became heavily vandalized and polluted, suffering a number of fires and eventually a gas line explosion, until the building itself was torn down in 2009. The neighborhood is home also to the now-abandoned Cary Elementary School. Students at the elementary level (grades preK–5) previously attended Roberto Clemente Elementary or Phoenix Elementary. Students in grades 6–8 attended Mark Twain Elementary School or Earhart Middle School. High school students attended Southwestern High School or Western International High School. At 6921 West Fort Street, Southwestern High School can be considered part of the Delray neighborhood, although most properties along this stretch of Fort Street are not normally included as part of the Delray neighborhood. In September 1907, Branch 8 of the Detroit Public Library system opened as the Delray Branch on West End Avenue. In January 1922, the branch was replaced with the James Valentine Campbell Branch on M-85 (West Fort Street). The branch operated until its closure in December 1996. In July 1999, the Campbell Annex Branch opened at the Holy Redeemer Cultural Center and closed in August 2004, only to reopen as the Campbell Branch at Lawndale Station. The neighborhood currently contains no libraries but is closest served by the Campbell Branch Library. It is located outside of the neighborbood at 8733 West Vernor in the Springwells neighborhood. Interstate 75 was built over several blocks of Delray. ^ Coryat, John (1996–2009). "48209 zip code". Retrieved May 12, 2010. ^ City-Data.com (2010). "Delray neighborhood in Detroit, Michigan (MI), 48209 detailed profile". Retrieved 12 May 2010. ^ a b c d e f DetroitBlogger John (October 21, 2009). "Last Call? : A Beautiful Old Bar with a Storied Past Hangs in Limbo". Metro Times. Detroit. Archived from the original on May 27, 2012. Retrieved October 28, 2009. ^ a b c d Carlisle, John (DetroitBlogger John) (October 24, 2007). "Losing Grace: A Magnificent Church's Last Masses". Metro Times. Detroit. Archived from the original on February 29, 2008. Retrieved November 6, 2009. ^ City-Data.com (2010). "Boynton neighborhood in Detroit, Michigan (MI), 48217 detailed profile". Retrieved 22 May 2010. ^ a b c d e Lowery, Fred (June 17, 1994). "Delray Could Have Been Named 'Belgrade Beach'". Fort Lauderdale Sun Sentinel. Retrieved November 23, 2013. ^ a b c d Carlisle, John (2017-12-07). "Is this the end of Delray?". Detroit Free Press. Retrieved 2017-12-18. ^ Bruce, Joseph & Echlin, Hobey (2003). "Rude Boy and the Magical Land of Toxic Waste". In Fostey, Nathan (ed.). ICP: Behind the Paint (2nd ed.). Royal Oak, MI: Psychopathic Records. p. 115. ISBN 0-9741846-0-8. ^ "Cannot Agree on a Site: Delray Hungarians at Loggerheads over Church; Committee Divided Between West End and Dearborn Avenues". Detroit Free Press. October 28, 1905. p. 12. Retrieved November 26, 2013. Delray Hungarians cannot agree on a site for the proposed Catholic church and the committee will have to hold several more meetings. They want a church and a school. A plot of ground 200 feet [61 m] front and 150 feet [46 m] deep is needed for the buildings. ^ a b c "Church Anniversary Celebration Planned". The Detroit News. August 30, 2000. Retrieved November 24, 2013. ^ "Hungarians Fight Police". Detroit Free Press. May 15, 1906. p. 11. Retrieved November 14, 2013. ^ "Going Home to Europe: Hungarians in the Suburbs Fear Dearth of Work, Frightened by Recent Flurry in Money Market, Many Allens Seek to Save Cash By Spending Winter in Native Land—Will Return". Detroit Free Press. November 19, 1907. p. 10. Retrieved November 25, 2013. ^ "Hungarians Had Celebration". Detroit Free Press. March 20, 1905. p. 5. Retrieved November 24, 2013. ^ Elementary Boundaries: 2012/13 School Year (PDF) (Map). Scale not given. Cartography by DPS. Detroit Public Schools. Archived from the original (PDF) on November 1, 2012. Retrieved November 1, 2012. ^ High School Boundaries: 2012/13 School Year (PDF) (Map). Scale not given. Cartography by DPS. Detroit Public Schools. Archived from the original (PDF) on November 1, 2012. Retrieved November 1, 2012. ^ "James McMillan School, Delray, Detroit, Michigan". Belle River Nation. 2003–2005. Archived from the original on October 26, 2008. Retrieved May 22, 2010. ^ "Campbell Branch Library". Detroit Public Library. Archived from the original on November 11, 2011. Retrieved April 18, 2009. Beynon, Doanne Erdmann (Winter 1935). "Crime and Custom of the Hungarians of Detroit". Journal of Criminal Law and Criminology. 25 (5): 755–774. Archived from the original on November 23, 2013. Collum, Marla O.; Krueger, Barbara E. (2012). Detroit's Historic Places of Worship. Detroit: Wayne State University Press. ISBN 9780814334249. Godzak, Roman (2000). Archdiocese of Detroit. Charleston, SC: Arcadia Publishing. ISBN 9780738507972. Tutag, Nola Huse & Hamilton, Lucy (1987). Discovering Stained Glass in Detroit. Detroit: Wayne State University Press. ISBN 9780814318744. Woodford, Arthur M (2001). This is Detroit, 1701-2001. Detroit: Wayne State University Press. ISBN 9780814329146. "Environmental Justice Case Study: Delray Neighborhood Lawsuits Against Local Polluters". University of Michigan. Archived from the original on November 23, 2013. Guyette, Curt (February 9, 2000). "Raising Suits over Stink: Neighbors Take Southwest". Metro Times. Detroit. Archived from the original on November 24, 2013. ——— (January 17, 2007). "Raising a Stink: Delray Residents Say They're Getting Dumped on Again". Metro Times. Detroit. Archived from the original on November 24, 2013. "Hungarians Oppose Vreeland: Issue Statement Protesting Against Delray Deputy's Reinstatement". Detroit Free Press. January 28, 1906. p. 7. "Hungarians of Delray Dance for Sanitorium". Detroit Free Press. October 6, 1917. p. 7. "Delray Hungarians Protest". Detroit Free Press. February 28, 1906. p. 11. Wikimedia Commons has media related to Delray, Detroit.